The server is setup as a RAID 5 with 4 disks. It appears that 2 of the 4 disk are flashing amber. What are the chances that 2 disk go down at exactly the same time. Any suggestions here. Please HELP!!!! 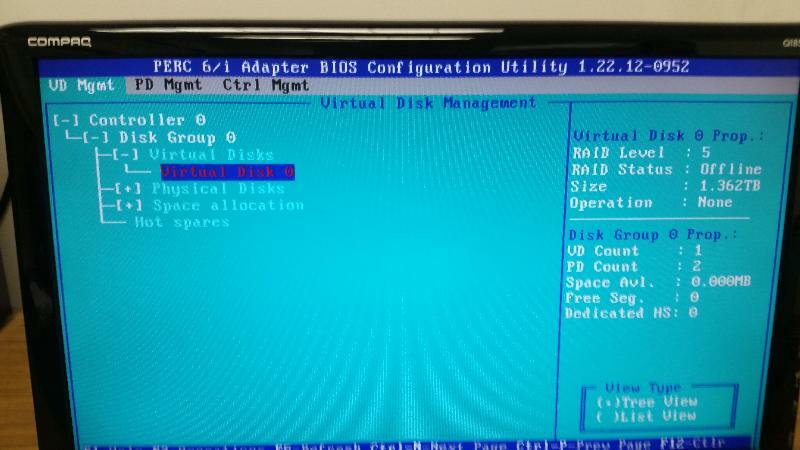 You may need to just force the disks online in the RAID controller. BUT, two drives CAN fail simultaneously. There's a reason people haven't recommended RAID 5 for years and instead recommend RAID 6. No UPS? GET ONE! And configure it to shutdown the server GRACEFULLY in the event of a power failure. REALLY hope you have good backups! Yes it's a Dell Server. We do have a UPS, but something must of failed on it. I do backup the server every night. So you thing I should just go into the configuration Utility and try to force the disk online? I haven't done anything as of yet, as its still in the state that it has been since I got here. Have seen hp raid 5 also been destroyed after outage. I haven't tried just re-power the server yet. I wonder I should try that before I get into the RAID Utility? You can try cold starting the server, in this link is described force disks online in perc raid bios. Boot to the controller BIOS utility (CTRL-R probably), highlight the controller on the first page (VD MGMT), and hit F2 ... if you have Foreign configuration options, attempt to IMPORT the foreign configuration. You don't want to force a drive online if you know which one is the most current, AND you won't have the option to force it online if it is flagged as foreign. What server and controller model are we talking about? I can't even boot to the RAID controller now. The option is not even available anymore???? Power down and try reseating PERC card. Select one offline disk and hit f2. It will not expand the Physical Disks? Did you goto PD mgmt? On the picture you are in VD mgmt, go to PD mgmt. Ok got to PD Mgmt. here is screen shot. Only 2 of the 4 disk are showing up. It is not seeing the disks at all... what happens if you pull one faulthy drive and put it back in, any response? The freezing up gives me the feeling you controller or backplane is defective. Do you have active Dell support? OK i am just to the point where I want to start completely over. I just wan to rebuild the RAID and clear all hard drives. I deleted the VD, but still can olny see 2 of the 4 hard drives. Is there a way to completely clear everything!! Power off the server, plug out the power cord, with that done press the power button to dispel any remaining power, wait ten minutes then plug it back it in and let it boot up, if problem persist a rebuild of the server is in order, and I do recommend raid 10, it has better fault tolerance and performance, as mention above raid 5 should not be used let alone in mission critical environment.
" 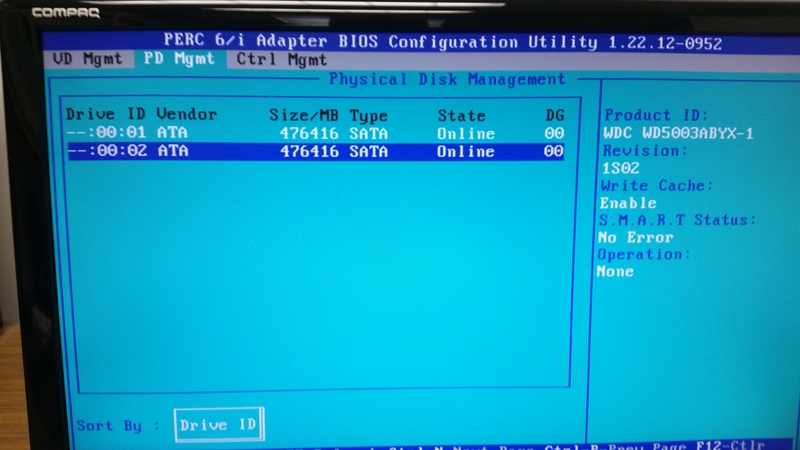 I created a new RAID 5, with a the hard drives. Looks like I am starting over and restoring from backup tape"
Or raid5 plus spare, is a lot quicker.... all depends requirements. lets hope everything is up and running by now and the little panic has gone. Patrick, you obviously haven't been following Storage recently. RAID-5 has been deprecated! The risk of a second disk failing while the first rebuilds has now got unacceptably high. We do not recommend RAID-5 any more (with or without a spare). Ok, I wanted to give an update. I have completely rebuilt the server. I have restores my data files back from backup. I did take eveyones advice by not using a RAID 5. However I had to do something a little different because of timing and hardware. I had to replace 2 of the 4 drives from the raid. So when I went to rebuild I only had 2 drives to start. So I setup a RAID 1 with the 2 drives and installed the O/S. I just got 2 new drives which I just setup also as a RAID 1 for my DATA. I we be reinstalling our accounting software and management software. Thanks god I do full backup's everynight. The load on this server is really minimal because this is a very small office with only about 5 people. Thanks for everyone's help and suggestions. I ultimately rebuilt the entire server. I took everyone suggestions and didn't use RAID 5. However I ended up using 2 RAID 1's. OS one of the RAID 1's and Data on the other RAID 1.